China, 1911-1937. Leiden and Boston: Brill, 2003. The concept of style that Hockx pursues in this study of Republican-era literature is a set of features involving not only language but also lifestyle, style of organization of literary activity and production, and style of publication (13). This method of research opens up a broader vision of literary activity and production to systematic study than has existed. Graduate students for decades have been sent into the stacks of libraries to acquaint themselves with journals and their appearance and content, but perhaps never with the rigor and scope that Hockx has brought to this task of making journals the text of study, rather than the context. His survey of literary organizations and their journals reveals that, as much as Shanghai played a key role in national distribution of journals, it was not the hub of literary societies themselves nor the writing of their members, which were spread across the nation. The “horizontal reading” method across issues of specific journals—not necessarily in bed—calls attention to the role of journals in shaping a unity of or at least strongly suggestive links among the material submitted by various individuals. An examination of abusive criticism demonstrates the collective imposition of a “normative form” upon individual writers, forcing them into a prescribed “constellation of style, language, context, and personality” (221). The issue of censorship highlights the role of writers, editors, and publishers as a group protesting specific acts of formal government censorship, negotiating for a system of censorship that benefited distributors and respected literary writing as a field with “field-specific knowledge” (243) not to be tampered with by hack censors. Another virtue of Hockx’s book is, as befits the title, is its heuristic approach. The number of questions to which it calls attention is substantial. These range from why writers were so drawn to collectives (89) and the cultural status of New Poetry (186) to how zazu “fun and games” sections of early Republican journals were organized (134) and the potential for teams of scholars conducting horizontal readings of journals that, Hockx notes, would extend well beyond his own “fragmentary” readings (134). At times these questions may seem to be trivial or suggest immediate answers: writers formed associations and societies around their journals to present the image of a “writerly”field of activity and production composed of western-educated cognoscenti. Perhaps such is the case, but, to his credit, Hockx is too meticulous in his scholarship to want to close off, rather than open up, where his questions might lead. The leading question might be lifted from one such string of questions as whether his research does “force us to consider collectives, rather than individuals, to be the main operatives within the field?” (126). It is this issue of literature as an institution in the sociology of culture, the field of cultural activity and production, that is the principal concern of Questions of Style. The field is the privileged context for interpreting literature, as distinct from considering literature in some form of unmediated relationship with society at large or as endless (inter) textuality. Much of this does involve rhetorical features of textual style: arguments as strategies for self-promotion, such as the anti-elitist posturing on behalf of “unknown authors” and the avant-garde claims of “double rupture” with both traditionalists and the new cultural ‘establishment; the forms of abusive attack on fellow writers; the disciplining of writing to conform to a “normative form” as “a constellation of style, language, context and personality” (221). But style is a broader and more unstable term in this study. It designates features of a literary field (mode of living, organization, publication, as well as language). Yet it also, as in the quotation above, is subsumed as an element of “normative form.” It may be opposed to individual, author-centered studies as the dominant concept surrounding the production, consumption, and study of literature (125), or it may be an attribute of an individual, as in the chapters discussing Liu Bannong and Zeng Jinke. Finally, it may already be a set of features erroneously interpreted by readers involved in constructing canons, as when Hockx in his conclusion divides the literary field, or fields, into “representatives of styles more continuous with tradition” and “anti-traditional styles” to point out that, rather than literary studies being too author-centered, literarystudies have allowed a situation in which “[t]hese latter styles ended up being canonized and have been at the center of our thinking about modern Chinese literature for decades” (253). That Hockx asserts that it is “styles” that have been canonized is ambiguous. Does a style represent a field or sub-fields, genres or authors? If more than one style was canonized, does this suggest greater plurality than his arguments otherwise suggest? Is that plurality, again, associated with field, fields, genres, or authors? What are we to conclude from the useful but ultimately unstable concept of style? 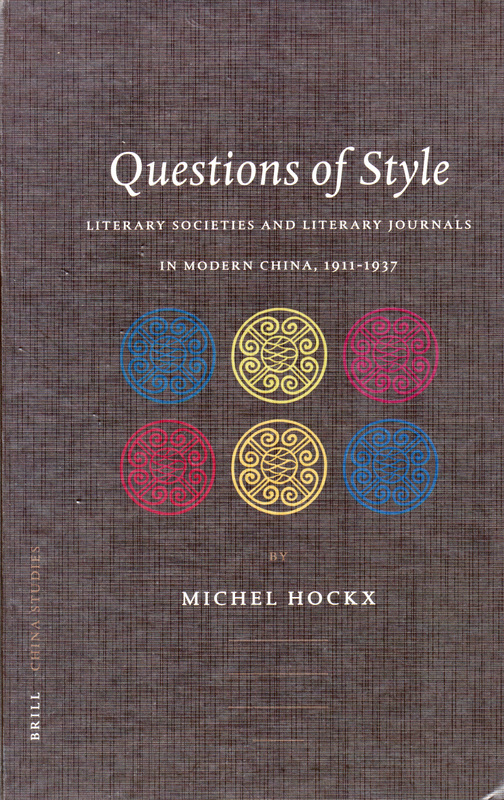 Style as Hockx uses it is extremely useful in focusing attention upon the collective features of literary activity and production that are, indeed, often overlooked. Hockx offers well-argued evidence of the impact of field-like activity and production, such as apparent instances of habitus, of “field-specific knowledge,” of attention to writers and their activities as something distinct from that of other members of society, and of conformity to “normative forms.” Hockx shies away from clarifying whether he is discussing one or more fields, and from identifying one or more actual hierarchies within the field(s), as Pierre Bourdieu’s studies of French culture did. Perhaps this is because these have proven difficult issues to resolve in later studies of other societies. Among the most difficult cases that Hockx seeks to make are those for the unity of journal issues as texts and the privileged place of journals as objects of study. As Hockx puts it, “a journal issue . . . possesses a certain measure of unity, which, as in the case of a novel, can be emphasized by means of analysis and interpretation” (124). He modifies this point in several ways, as in discussing journal issues of the 1910s as “polyvalent idiolects open to multiple interpretations. Or, in plain English, they are literary texts” (143). How, then, to define or measure the unity that he argues for becomes a question, as does whether the definition of literary texts that he offers is really confined to what would be considered literary. Readers of contemporary magazines, as well as critics of culture industry, have observed that magazines may contain conflicting arrays of views in them, the better to appeal to a wider market. That may not mean that they have no unity nor that they cannot be read as literary texts, but that Hockx’s arguments are more heuristic than definitive. 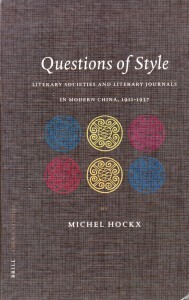 In arguing for the significance of reading across journals, Hockx points out the ways in which an early poem by Chen Hengzhi, “People Say I’m Crazy,” appearing in New Youth magazine, generates questions about its relationship to the most famous literary piece to appear in that journal, Lu Xun’s “A Madman’s Diary,” stimulating worthwhile observations about both the interpretations of these texts and about literary history. As much value as there is in this argument, it does obscure the fact that extreme mental distress and mental illness were tropes common to a wide range of texts, from Zhang Taiyan’s assertions in speeches to students in Japan that his own mental illness gave him the courage to speak out bold truths on political issues, to media ads for medicine to soothe young intellectuals faced with overwhelming national issues, and, of course, modern literature from abroad and classics from within China. In other words, Hockx certainly shows that journals should indeed be examined with greater care than they have received, but not that they are a form of text to that should take precedence over the study of other sources. After all, writers and journals must bring forms of distinction into their genre and their field from sources outside these institutions. Hockx has made a major contribution to studying literature as an institution, yet why that institution should be studied and what its role is in forming canons are questions that still need answering.